The Board of Directors of Impact Healthcare REIT plc (ticker: IHR) (the “Board”), the real estate investment trust which gives investors exposure to a diversified portfolio of UK healthcare real estate assets, in particular care homes, is pleased to announce the Company’s intention to launch a 12 month placing programme (the “Placing Programme”) pursuant to which the Company will be able to issue up to 200 million new ordinary shares (“New Ordinary Shares”). The Company has invested or committed the majority of the £240 million of equity and debt capital raised since its IPO in March 2017, and, consequently, is implementing the Placing Programme in order to take advantage of a strong pipeline of opportunities. Impact Health Partners LLP (the “Investment Adviser”), acting on behalf of the Company, is pursuing a number of attractive potential investment opportunities that meet the Company’s investment criteria and return profile and are expected to deliver further value for its shareholders. The Company and its Investment Adviser are continuing to exercise robust capital discipline to deliver value at the point of acquisition or investment. The Investment Adviser is currently engaged in various stages of negotiations on potential acquisitions with a total value in excess of £400 million. There are currently twelve potential near-term transactions under review by the Investment Adviser and solicitors have been instructed on four of these transactions, two of which could potentially exchange in the near term. In addition, the Investment Adviser has identified organic growth opportunities to add over 500 beds to the Company’s existing portfolio where planning permission has been approved or is in progress. Up to 31 December 2018, capital has been committed (and in the case of Parkville II, a deferred payment mechanism employed) to add 188 beds (of the 500+ beds identified), which is expected to deliver an annual rental uplift of at least £1.3 million once these beds are operational. To date, 96 of these beds have been completed. The net proceeds of any Placing under the Placing Programme will be used to execute on the pipeline of opportunities identified by the Investment Adviser (or other potential transactions) and/or will be invested in organic growth opportunities within the Company’s existing portfolio. The Company has today published a circular (“Circular”) to convene a general meeting of shareholders to approve the issuance of New Ordinary Shares pursuant to the Placing Programme. Notice is contained within the Circular of the General Meeting to be held at the offices of Impact Health Partners LLP, 4th floor Heddon House, 149-151 Regent Street, London W1B 4JD at 10.30 a.m. on 5 March 2019 for the purpose of approving the resolutions. A copy of the Circular will shortly be submitted to the National Storage Mechanism and will be available for inspection at www.morningstar.co.uk/uk/NSM. The Circular will also be available shortly on the Company’s website www.impactreit.uk. 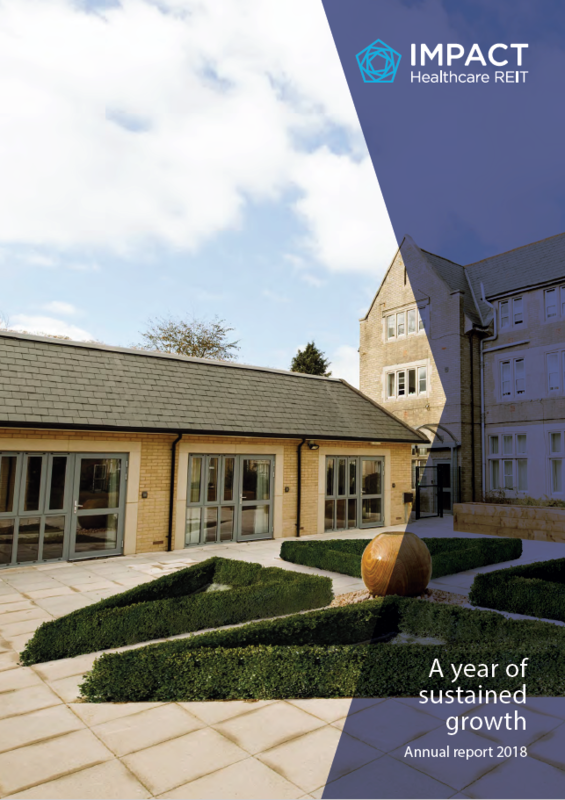 A prospectus in connection with the Placing Programme is expected to be published shortly. Terms used in this announcement shall, unless the context otherwise requires, bear the meanings given to them in the Circular. Further to the announcement on 30 January 2019, the Company has submitted an application for its entire issued share capital, being 192,206,831 ordinary shares of one pence each, to be admitted to the premium listing segment of the Official List and to trading on the premium segment of the main market of the London Stock Exchange (“Admission”). Admission is expected to occur with effect from 8:00 a.m. on 8 February 2019. The Company’s ticker, ISIN, SEDOL and LEI will remain unchanged. In conjunction with the application for Admission, the Company is required to make a statement as to the sufficiency of its working capital. Accordingly, the Board is of the opinion that the Company has sufficient working capital for its present requirements, that is for at least the next 12 months from the date of this announcement. In connection with the migration, the Company has made certain non-material amendments to its investment policy. 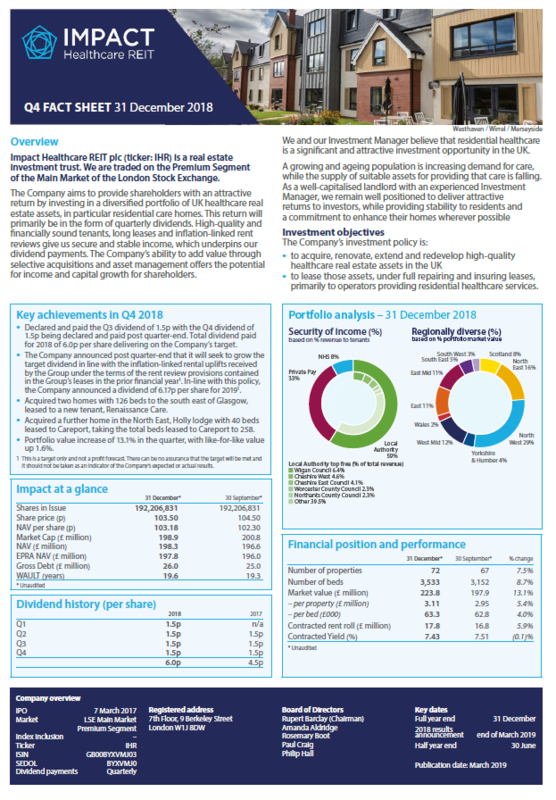 The updated investment policy is available on the Company’s website at www.impactreit.uk. 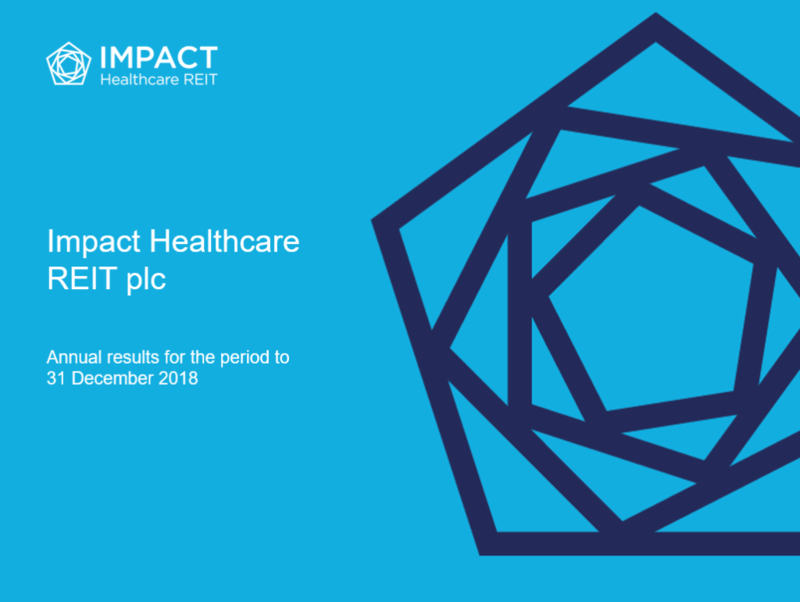 Impact Healthcare REIT plc is a real estate investment trust (“REIT”) which aims to provide shareholders with an attractive return, principally in the form of quarterly income distributions and with the potential for capital and income growth, through exposure to a diversified portfolio of healthcare real estate opportunities, in particular residential care homes. The Group’s investment policy is to acquire, renovate, extend and redevelop high quality healthcare real estate assets in the UK and lease those assets primarily to healthcare operators providing residential healthcare services under full repairing and insuring leases. The Group has declared or paid six quarterly dividends of 6.0 pence per share since IPO on 7 March 2017, which equates to a yield of 6 per cent. per annum on the IPO Issue Price. The Group’s ordinary shares were admitted to trading on the main market of the London Stock Exchange, Specialist Fund Segment, on 7 March 2017.